Described as shampoo for normal hair that provides gentle cleansing and nourishes hair. I had a few samples of this shampoo and have to say that it would be suitable mostly for dry hair. It were super nourishing and made my roots flat and greasy instantly. If you’re looking for a highly moisturizing shampoo, I recommend looking into this one. Made with cupuacu butter, camellia oil, and acacia extract, this is a very buttery eye cream that gives plenty of nourishment for tired under eye area. I enjoyed using the sample, but I prefer eye creams with lighter consistency (gels) so I won’t be getting a full size of this one. I’m a big fan of Dr. Hauschka skin care, especially its Revitalizing Day Cream (previously called as Moisturizing Day Cream) and Revitalizing Mask. I had already had a full size of this Soothing Mask a couple of years ago, so this sample was a lovely reminder of how good it is. It soothes and softens skin, calms, and reduces redness (especially, rosacea). An organic shower gel, with delicious, fresh scent, containing goji berries and lime extract. I’ve already had a few full-size bottles of this shower gel and using it in the mornings on a daily basis is lovely. The sample was not enough to see how the cream performs but it has a nice consistency and doesn’t leave white streaks. Hand creams aren’t something I use every day. However, winter leaves me no choice, but to change my attitude. Lately, I’ve been loving Odylique Lemon Butter Hand Smoothie, and I can say with confidence that this Dr. Hauschka Hand Cream takes a solid second place. It’s nourishing but absorbs quite fast and without leaving hands greasy. Are there any of your favorite products amongst these samples? I love a sunscreen without white streaks. Thanks for the reviews. 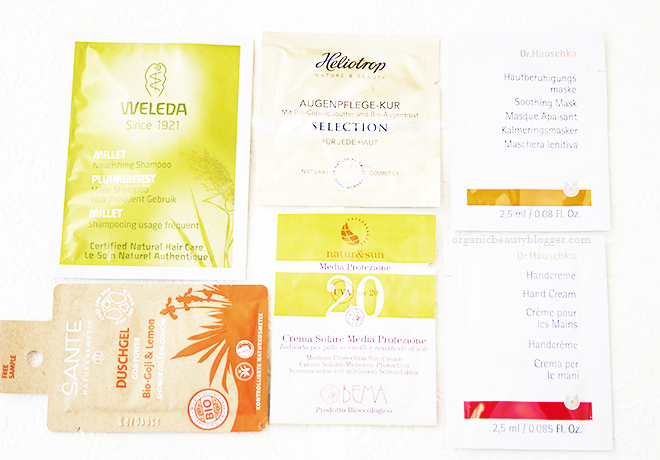 love samples, best way to try a product (and see how your skin reacts) before buying.